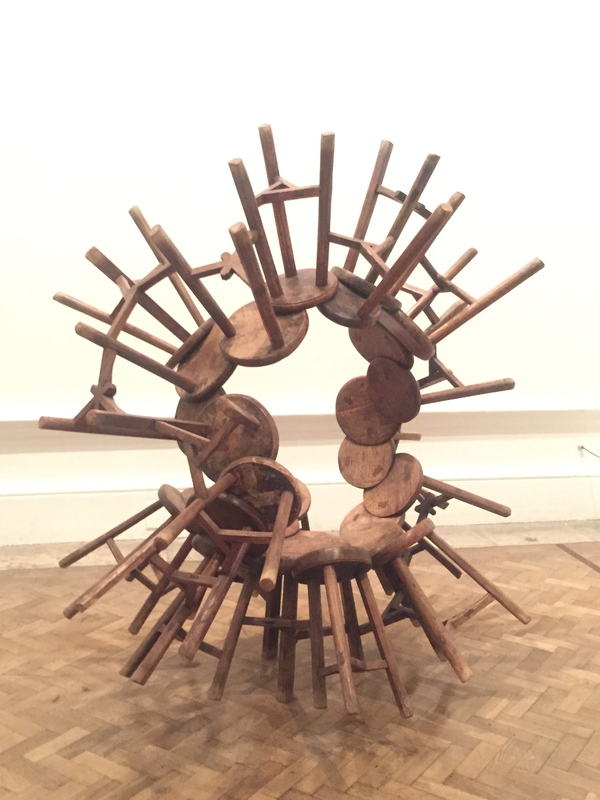 Although no stranger to blockbuster exhibitions, the Royal Academy’s current Ai Weiwei solo exhibition has proved so popular that the galleries will be opening round the clock for the final weekend. Does the first major retrospective of China’s, and arguably one of the world’s, greatest living artists live up to the hype? 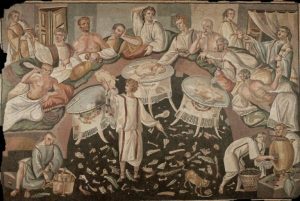 The answer is unarguably – yes: the exhibition is thought provoking, relevant and intelligent, and the artist lives up to his reputation as a provocateur and pioneer. Ai Weiwei first made a big impact in London with his unforgettable and poetic sunflower seeds installation at Tate Modern in 2010. 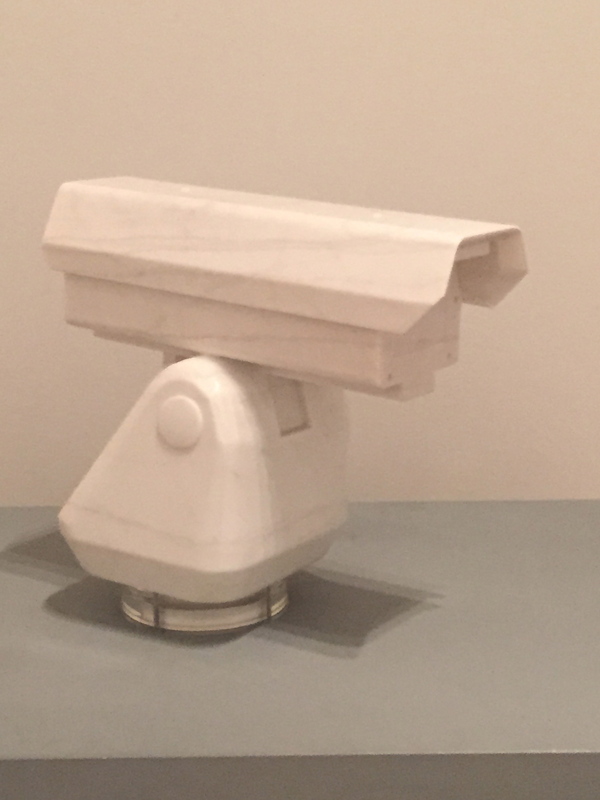 Fast-forward to 2015, after a spell of incarceration by the Chinese government, and the Royal Academy exhibition gives an incredible insight into the experience of imprisonment and surveillance, and is both political and beautiful. 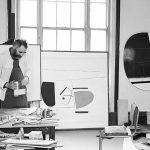 The exhibition is the first institutional survey of his work in the UK, and spans a prolific period of more than twenty years. 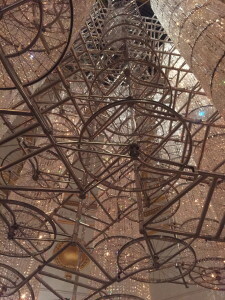 Whilst the majority of Ai Weiwei’s work is a visual form of political activism, through which the artist uncovers some of the less salubrious sides of Chinese governance, there is at the same time an inherent respect for the rich culture and craftsmanship of China, combined with a deep knowledge of Western art history. 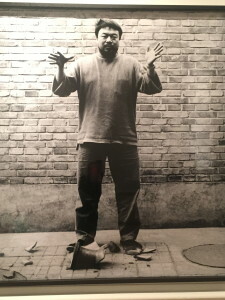 Born into an artistic dynasty – his Father, the famous Chinese poet Ai Qing was exiled to Xinjiang during the late 1950’s anti-rightist campaign, which was the seed of Ai Weiwei’s activism. Ai Weiwei attended the Art Students League of New York between 1983-1986, where he was exposed to the art of Andy Warhol, and began to create conceptual artworks inspired by Marcel Duchamp. 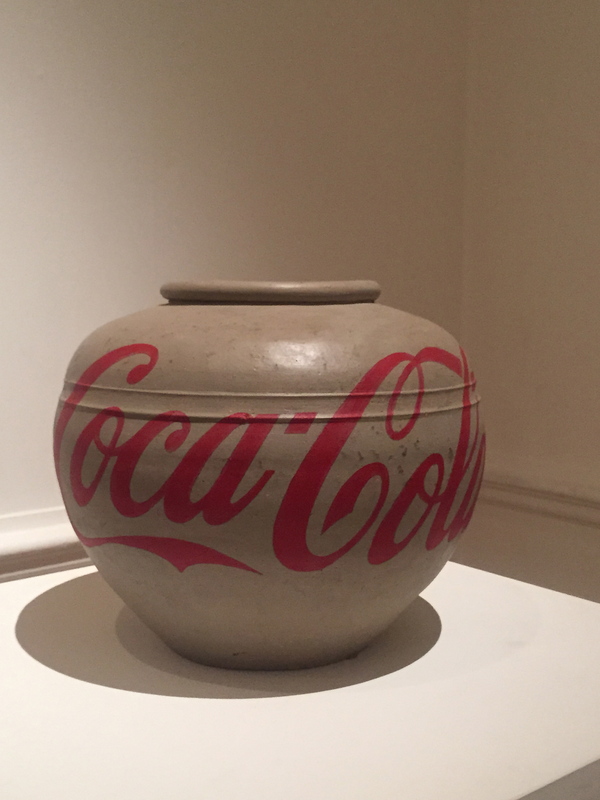 Duchamp and Andy Warhol continue to influence his work, as is evident in the RA exhibition which features a Warholian Ming Dynasty vase tagged with the Coca-Cola logo, and Duchampian ready-mades such as a cluster of Qing-era stools titled ‘Ai Weiwei’s Grapes’, and the breathtaking pièce de resistance ‘Bicycle Chandelier’. 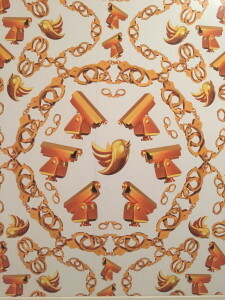 However Weiwei is more than simply a Chinese Pop Artist, he is a master of social media with a huge following, and he references the power of Twitter at the RA exhibition with ‘Golden Age’, tongue in cheek wallpaper featuring the Twitter icon surrounded by surveillance cameras and handcuffs: a metaphor for his 81-day incarceration by the Chinese government in response to his political activism. 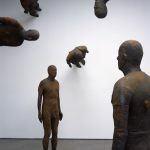 His imprisonment is represented at the RA by a room filled with 6 rusty boxes containing maquettes of his prison cell, where 2 guards watched him 24/7 and subjected him to a kind of psychological torture. Ai Wewei refers to surveillance elsewhere in the exhibition where he fills a room with a marble representation of his son’s buggy in a park and a marble surveillance camera and handcuffs, representing a time when he was followed by a plain-clothes policeman whilst taking his son for a walk. The most powerful room in the exhibition contains an installation titled ‘Straight’, an homage to the 5,000 school children who lost their lives during the 2008 Sichuan earthquake. 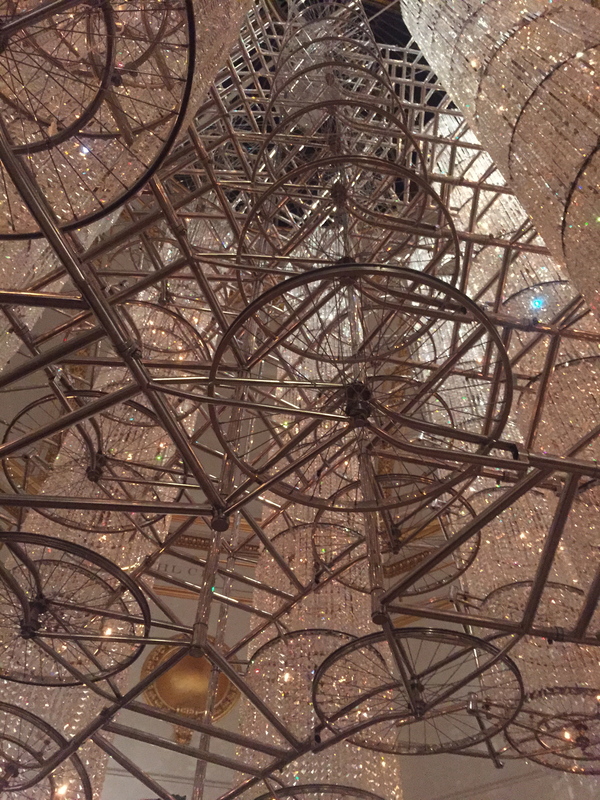 Ai Weiwei made it his mission to uncover the names of the victims of the earthquake and the officials involved in the substandard construction of the schools, and published the names on his blog after the Chinese government attempted to sweep the disaster under the carpet. 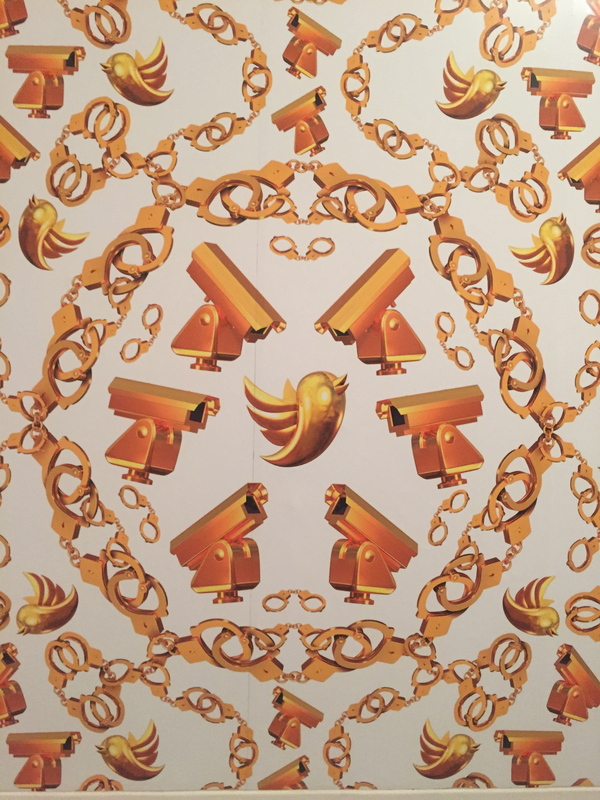 The blog was shut down by the government and Ai Weiwei imprisoned as a result. ‘Straight’ was made from 90 tonnes of metal reclaimed from the site of the earthquake, with each piece of gnarled metal battered into a straight line and assembled into an undulating sculpture evoking a map of China. 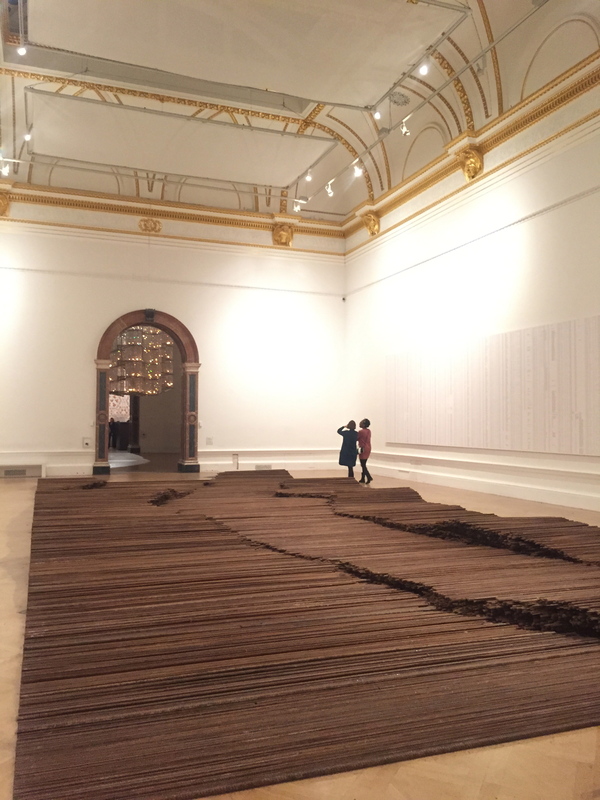 The Royal Academy has hosted exhibitions of some of the most influential artists, living and dead, from Rubens and Van Gogh to Anish Kapoor and David Hockney. 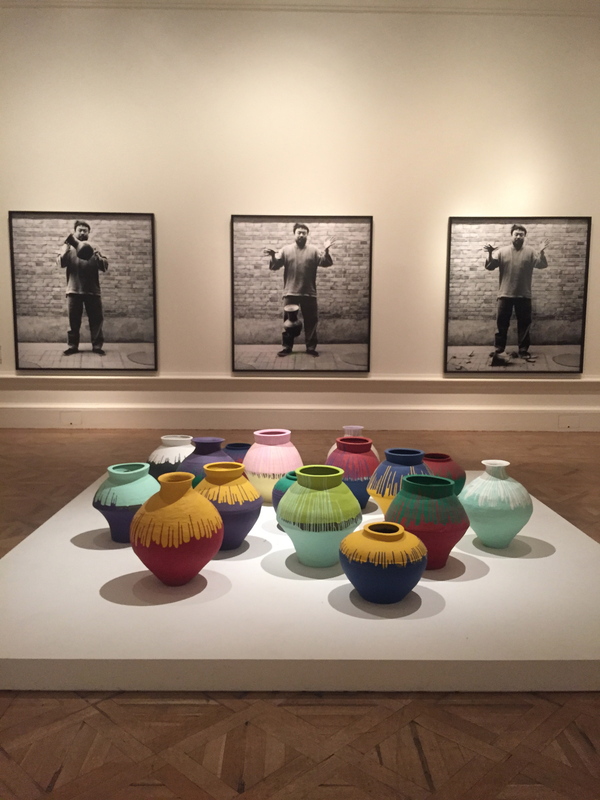 At the age of 58, Ai Weiwei gives his predecessors a run for their money, filling the hallowed halls of the RA with vital, powerful art that is both a reflection of contemporary life, and an examination of political deviance and hypocrisy. Ai Weiwei at the Royal Academy of Arts until 13 December. This entry was posted in Art Reviews., NEWS and tagged Ai Weiwei, art exhibition, China, Duchamp, exhibition, London, Pop Art, Royal Academy. Bookmark the permalink.